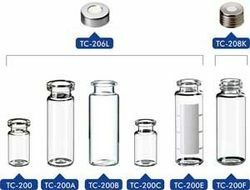 We are a leading Wholesale Trader of snap ring vial, caps with septa, gas tight syringes, headspace vials, headspace vials screw top and screw cap and pouring ring for youtility bottles from Vadodara, India. The 6cm V6 syringe is designed and manufactured under stringent manufacturing and quality standards. 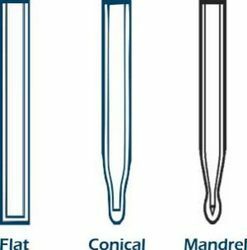 These precision syringes are commonly used in clinical and analytical instrumentation where precision dispensing is critical. 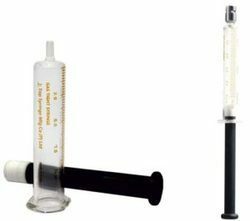 The syringes are able to handle your critical applications. 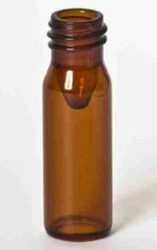 High quality headspace vials have a bevelled neck for a secure seal, uniform glass thickness for even heat distribution and a stable, strong design for ease of use. They are available with rounded or flat bottom profiles for accurate instrument compatibility. 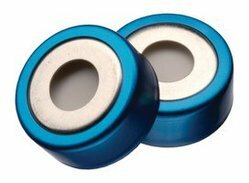 Use with the 20mm headspace caps, septas and seals. 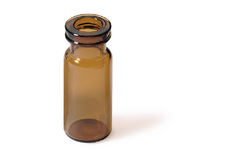 headspace vials have a bevelled neck for a secure seal, uniform glass thickness for even heat distribution and a stable, strong design for ease of use. They are available with rounded or flat bottom profiles for accurate instrument compatibility. Use with the 20mm headspace caps, septas and seals. 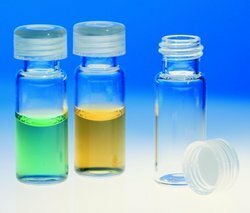 All vials are manufacture with USP type 1 glass. 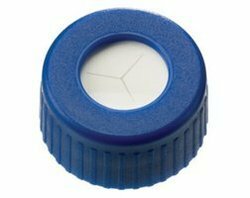 Screw Cap and Pouring Ring for Youtility Bottles Screw Cap features a secure grip, fast opening and quick closing. It has comfortable grooves and ridges for a more efficient and easier tightening or removal, especially with smaller sized or gloved hands. The inverted cone form and reduced cap diameter offers significant advantages, making handling easier and safer. The shortened thread inside the cap permits faster opening and closing, but is fully compatible with standard DIN GL 45 bottles. 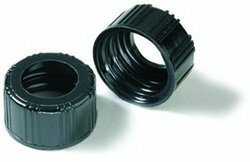 The tried and tested cap plug sealing system ensures a liquid tight seal. Besides, it has predefined labeling area which is compatible with the dedicated Duran self-adhesive Youtility labels. The Youtility screw cap features an integrated two or three character Retrace Code to provide product traceability via a downloadable certificate. The cap is manufactured from a food grade polypropylene that is fully autoclavable and totally reusable. 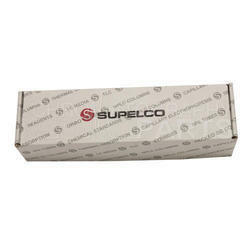 Our organization is known for offering a rich assortment of Shell vials. We are engaged in providing our customers with supreme quality products with the help of which we provide them the support to keep their business process streamlined in a well-maintained manner. 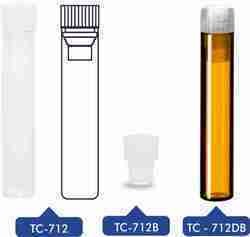 Our organization is known for offering a rich assortment of HPLC Vials. We are engaged in providing our customers with supreme quality products with the help of which we provide them the support to keep their business process streamlined in a well-maintained manner. 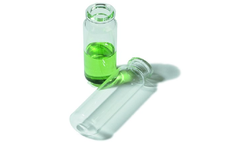 Headspace vials have a bevelled neck for a secure seal, uniform glass thickness for even heat distribution and a stable, strong design for ease of use. They are available with rounded or flat bottom profiles for accurate instrument compatibility. Use with septas and seals. Broad range of EPA Vials in clear and amber glass. Volume of 20ml, 30ml, 40ml and 60ml available. 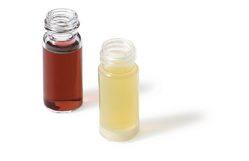 All types of EPA vials can be delivered against a small surcharge with a certificate of cleanliness that might especially be needed for TOC analysis. 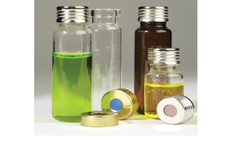 EPA Vials can be obtained with any type of screw seal ND 24. Class A, conformity certified. Made from Boro 3.3, Supplied with a square grip PP stopper. Marks and inscriptions in ETERNA amber diffusion stain, particularly resistant to aggressive cleaning methods. TO DIN EN ISO 1042. All volumetric flasks are supplied with a batch number and an accompanying batch certificate in the original packaging. With the consistent demand from our prestigious clients, we are persistently offering a wide assortment of GC HPLC Accessories in standard as well as customized sizes as well as shapes. Each accessory from the provided range is made with the usage of premium quality basic materials and highly advanced technology in compliance to set industry norms. 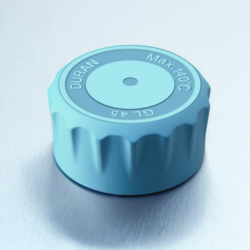 Crimp caps provide the tightest seal, reducing the chance of sample evaporation. The 12x32mm crimp vials and 11mm aluminium crimp caps are economical and easy to use with crimping tools. 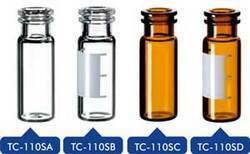 All vials are manufacture with USP type 1 glass. 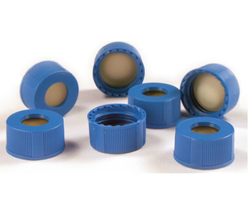 11 mm snap caps provide a secure seal that minimises evaporation, even with volatile samples. Snap caps are often more convenient than crimp caps as they can easily be applied and removed by hand. An audible click ensures a secure seal has been formed and that the cap is correctly aligned. Snap/crimp vials can be closed with either snap caps or crimp caps. 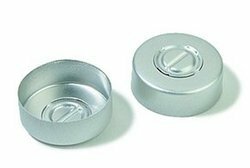 Inter-seal bonded caps eliminate expensive and time consuming hand assembly while preventing liner fallout. They are made by a bonding process that bonds PTFE/silicone into polypropylene closures without using adhesives. The bonding property seals and secures the septa within the vial opening. This integrated one piece system withstands multiple injections, making it very cost effective. Closures using pre-cut septa are available in a variety of caps and seals. The pre-cut septa are manufactured by making a slit in the silicone layer, but leaving the PTFE barrier uncut. Less pressure is required for the autosampler needle to penetrate the pre-cut septa as compared to non-slitted septa, resulting in fewer bent and/or broken needles. The uncut PTFE layer provides a better seal than other commercially sold slitted septa until the needle punctures the septa. This design provides the needle with a larger target area for penetration even when the needle doesn′t come down in the center of the septa. The products are available in four closure styles thatn can be used with crimp style and screw thread vials. They are each sold in packs of 100 each. 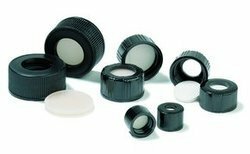 Limited volume inserts are an economical solution in sample analysis to reduce the use and waste of solvents and small samples. For optimum instrument performance and accurate test results, use the guides below to ensure that the correct insert is used with the appropriate autosampler vial. The Insert is neck less and always has to be used within a vial. 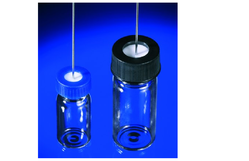 The diameter of the Insert depends on the size of the vial opening. Inserts reduces the volume, so that the needle is capable of picking up even smallest sample quantities. The larger the top of an insert, the more the volume can be reduce. 13mm vials have a 13-425 GPI thread and can hold up to 4ml of sample. They are used by the Waters 48-position autosampler and many others. 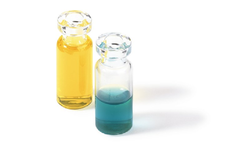 All vials are manufacture with USP type 1 glass. Barrier Septa (Silicone bonded to aluminum. Use in sealing applications where non-permeability and low volatility are required at temperatures above 177 °C. Affected by many organic solvents. Butyl (maximum temperature 200 °C). Use with many organic solvents: acetic acid (<50%), acetonitrile, acetone, alcohols, DMSO, phenol. Not compatible with alkanes, benzene, carbon disulfide, chlorinated solvents, cyclohexane. Red Rubber (maximum temperature 100 °C). Use with many hydrocarbons, acetonitrile, alcohols, cyclohexane. Not compatible with chlorinated solvents. Silicone (maximum temperature 250 °C). Use with acetone, alcohols, DMSO, ether, aqueous samples. Affected by many organic solvents: acetonitrile, benzene, , hexane, pyridine, tetrahydrofuran, toluene. PTFE/rubber (maximum temperature 100 °C). Use with most organic (until pierced). Resistant to chlorosilanes. PTFE/Silicone (maximum temperature 250 °C). Use with most organic (until pierced). Not recommended for use with chlorosilanes. PTFE/Thermoseal (maximum temperature 300 °C. An improved grade of silicone septa that can be used at higher temperatures. Affected by many organic solvents. Viton (maximum temperature 315 °C). Resists mineral oil, aliphatic and aromatic hydrocarbons, high concentrations of acids, high temperatures. Not compatible with strong bases, ketones, low molecular weight esters. PTFE Liner (maximum temperature 225 °C). The thickness of this material is 0.010". This material is used as an inert barrier for use with hydrocarbons and alcohols. 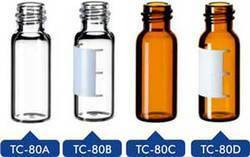 8mm (8-425) screw neck vials are the original smaller opening autosampler vials manufacture with USP type 1 glass. 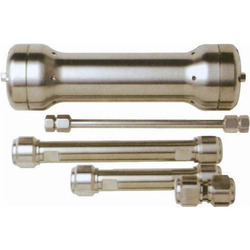 They are designed to work in a variety of autosamplers requiring narrow neck vials. chintan enterprise are offering Bi Metal crimp seal.